12 January 1961: Major Henry J. Deutschendorf, United States Air Force, 43rd Bomb Wing, Strategic Air Command, flew from Carswell Air Force Base, Texas, to Edwards Air Force Base, California, with a Convair B-58A-10-CF Hustler, serial number 59-2442, named Untouchable. There, he flew two laps of a 1,000 kilometer circuit between Edwards and Yuma, establishing six new Fédération Aéronautique Internationale (FAI) speed records at an average of 1,708.82 kilometers per hour (1,061.81 miles per hour). 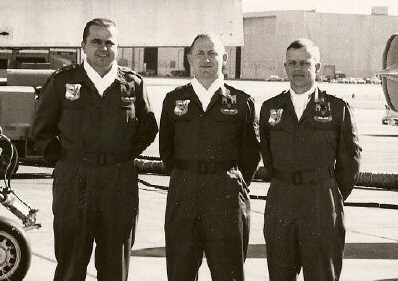 Major Deutschendorf and his crew, Captain Raymond R. Wagener, Defensive Systems Officer, and Captain William L. Polhemus, Radar Navigator/Bombardier, were each awarded the Distinguished Flying Cross. Untouchable, the record-setting Mach 2+ strategic bomber, was sent to The Boneyard at Davis-Monthan AFB, Tucson, Arizona, in 1969. 59-2442 was scrapped in 1977. The Convair B-58 Hustler was a high-altitude, Mach 2+ strategic bomber which served with the United States Air Force from 1960 to 1970. It was crewed by a pilot, navigator/bombardier and a defensive systems operator located in individual cockpits. 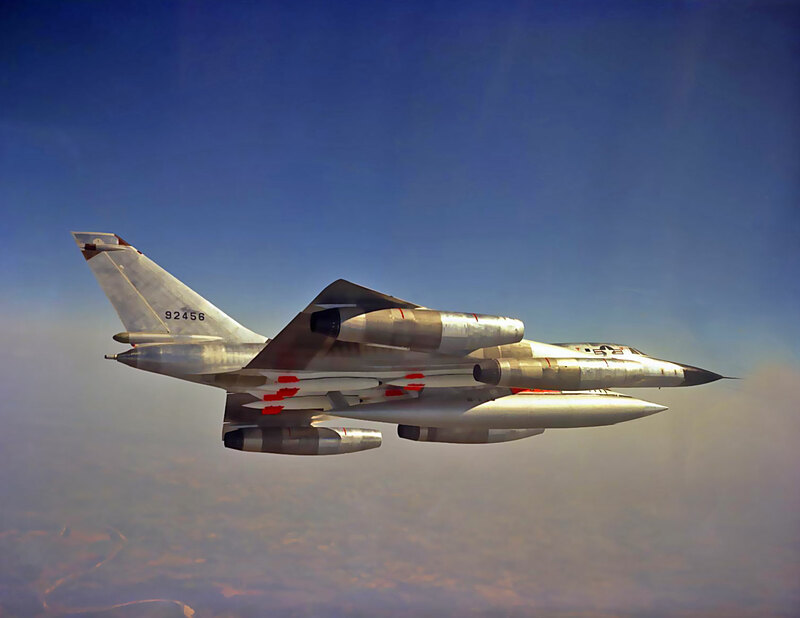 The aircraft has a delta-winged configuration similar to Convair’s F-102A Delta Dagger and F-106 Delta Dart supersonic interceptors. The Hustler is 96 feet, 10 inches (29.515 meters) long, with a wing span of 56 feet, 10 inches (17.323 meters) and overall height of 31 feet 5 inches (9.576 meters). The wings’ leading edge is swept back at a 60° angle and the fuselage incorporates the “area rule” which resulted in a “wasp waist” or “Coke bottle” shape for a significant reduction in aerodynamic drag. The airplane’s only control surfaces are two “elevons” and a rudder. There are no flaps. The B-58A was powered by four General Electric J79-GE-5 axial-flow afterburning turbojet engines, suspended under the wings from pylons. This was a single-shaft engine with a 17-stage compressor and 3-stage turbine, rated at 10,300 pounds of thrust (45.82 kilonewtons), and 15,600 pounds (69.39 kilonewtons) with afterburner. The J79-GE-5 was 16 feet, 10.2 inches (5.136 meters) long and 3 feet, 2.0 inches (0.965 meters) in diameter. The bomber had a cruise speed of 610 miles per hour (981.7 kilometers per hour) and a maximum speed of 1,325 miles per hour (2,132.4 kilometers per hour). The service ceiling is 64,800 feet (19,751 meters). Unrefueled range is 4,400 miles (7,081 kilometers). Maximum weight is 168,000 pounds (76,203.5 kilograms). 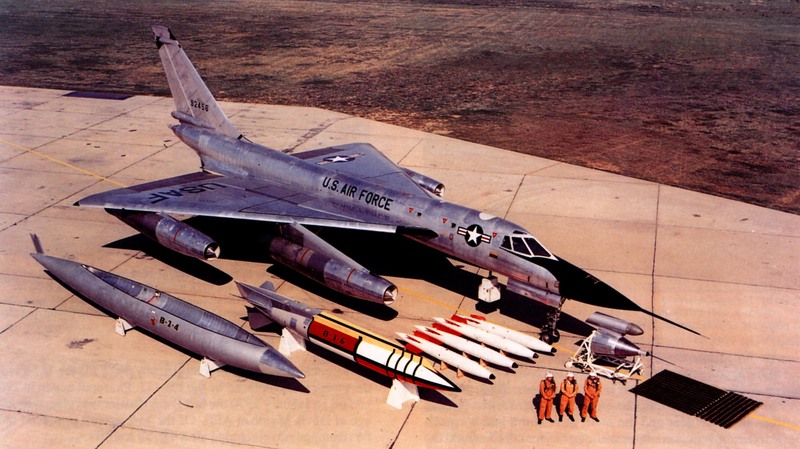 The B-58 weapons load was a combination of W-39, B43 or B61 nuclear bombs. The large weapons could be carried in a jettisonable centerline pod, which also carried fuel, and the smaller bombs could be carried on hardpoints. There was a defensive 20 mm M61 rotary cannon mounted in the tail with 1,200 rounds of ammunition. The gun was controlled remotely by the Defensive Systems Officer. Convair built 116 B-58s between 1956 and 1961. They were retired by 1970. Recording star and songwriter John Denver’s father. Sorry Bryan. I should have read the story first. The B-58 was always one of my favorite aircraft and on occasion I was able to watch one do a little “faster than normal flyover when I lived on March AFB as a kid.